Wild Cards Score Team Record 42 Runs! They say offense is a premium. Apparently it is for the Wild Cards. They piled a lot of runs.... I mean a lot of runs in their game against God Squad. As God Squad got destroyed, by a football-like score 42-12. They at times, looked lost and confused as they tried to stop these hot hitting Wild Cards. That can certainly happen when your are playing against the Wild Cards. Not only it was a perfect night as a team, but it was a great night for the Wild Card players as well. Each player had a multiple hits and had at least 1 RBI. 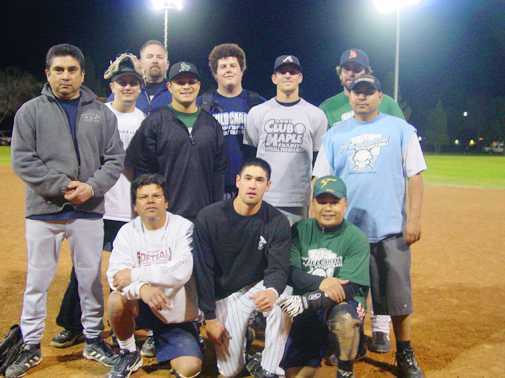 Wild Cards fought a valiant fight this week, but came up just short in a close loss to the Yard Dogs, 17-12. Trailing 4-2 after the first inning, Yard Dogs jumped all over the Wild Cards by scoring 11 big runs in the 2nd inning, 3 runs in the 3rd inning and 2 runs in the 4th inning. Thanks in part to their consistent hitting as well as their altered bats. However, with major adjustments , the Wild Cards managed to fight off their slump and weathered the Yard Dogs' offensive storm (and cheating bats), by scoring 2 runs in the 5th inning, 3 runs in the 6th inning and 3 more runs in their last at-bat, but just fell short. The loss snapped the Wild Cards' 7 game winning streak as well as putting the Wild Cards into a 1st place tie with the Yard Dogs. Wild Cards Hold on to Win! After being down, 10-3, Wild Cards fought back with 10 runs in the 4th inning ,3 more runs in the 5th and another 3 runs in the 6th inning to lead 19-13. Swing Bunts rallied back with back to back Home Runs in the 7th inning, but it wasn't enough as they came up short. Wild Cards wins nip and tuck battle 19-15. Despite missing Bobby and Dugas, having only 7 guys and 1-pick up from the stands, Wild Cards managed to hold off Heavy Hitters for the first 2 innings until reinforcements arrive. Down 7-6, Wild Cards rallied back and never relinquished the lead as they defeat Heavy Hitters 25-8. Raulo Romero led all Wild Cards with a perfect 5 for 5 HR 2B, HR and 2 Rbi's while Bobby Rodriguez did the same by going 3 for 3 and 3 RBi's. As usual the Wild Cards started off cold and flat, as The Meat were pounding the ball to take the lead 7-2. However in the bottom of the 3rd, Wild Cards bats woke up scored 5 runs in the 3rd, 5 runs in the 4th, 5 runs in the 5th and topped it with another 4 runs the 6th. The Meat couldn't keep up with the fierce Wild Cards' offensive attack. By the time they made adjustments, they couldn't recover. Wild Cards win their 2nd game in a row by 21-10. Wild Cards open their season in Camarillo with an impressing win over the 2-time C league champs, God squad, 27-10. Eventhough the Wild Cards showed some signs of rust on defense, their bats stole the show. Four consecutive Home Runs, in the 4th inning and a total of 8 Home Runs in the game just the crushed the opposition. Every Wild Card player had at least one hit. "It was a good win to start the season. Hopefully we can continue to win games, because its going to be a long season" said Wild Cards Manager Virgil Tomas. Rico's Chiropractor came out on fire and took a early lead 9-4 and ruffed up Hector Calderon and the Wild Cards. Wild Cards struggled again on offense. As It did not help their cause by putting up three goose eggs the next three innings but still able to hold off Rico's high scoring offense. Rico's was doing well for the first 5 innings leading 16-4, taking advantage of the winds, Wild Cards errors and walks. However with the Santa Ana Winds still blowing at 30-40 MPH, Rico's offense and defense just went cold for the last 3 innings. Which turned the tide for the Wild Cards, as they got off the floor and managed to rally back. Thanks to too many walks, mixed in with a bunch of singles, doubles triples from Goodenough, Carpenter, Tomas, Garcia, Romero, Rabago and Emery and a moster 3-Run Hr from Raul Narez to pull with in 1 run. The Final big blow came from Hector who hit a hard line drive to right center to drive-in the tying run and the go ahead run. While player/Manager Virgil Tomas drove in another run for insurance to give the team a 19-17 lead going to the top of the 7th inning. Raulo Romero then relieved Hector Calderon and help shut down Rico's Chiropractor by only allowing 1 HR and leaving 2 runners on base for the save. Wild Cards who struggled early and were almost ready to give up, came back from a 11 run defeicit and pulled an amazing come from behind win and shocked the highly favored Rico Chiroprator 19-18. It was a close game, as both teams exchanged runs in the early get go, but the Wild Cards were still holding on to a 12-7 lead in the top of the 3rd. No Chance rallied back with 1 run in their 3rd inning, but Hector Calderon and the Wild Cards defense shut down No chance, leaving the bases loaded. From there on the Wild Cards stepped up with tight defense and strong pitching, only allowing 4 earned runs in four innings. Their offense also came alive and put the game away as they defeat No Chance 26-11 and advance to the Oxnard City League Championship game for the second consecutive time. Wild Cards Defend their Title for the 2nd time. Young Guns go Ballistics with the Longball. On this late cold night, this championship game between D-12 (Dirty Dozen) and the Wild Cards was a total blow out in favor of Virgil and the gang. Right from the start, the hot hitting Wild Cards banged out 6,5,9,6,0,0,0 runs in their half of the innings to their 3,1,0,0,0,0,1. Home runs by Narez, Dugas, & Tomas, topped off by moonshot HR's by the young guns, Stanley, Emery, Goodenough and Carpenter ultimately destroying D-12. What thought to be a close game just wasn't meant to be. Thanks in most part to also great pitching by Hector Calderon and the Superb Wild Card defense. Everything just kicked into high gear for the Wild Cards as they win their 2nd Straight City Championship in 2007 by crushing D-12 26-5.